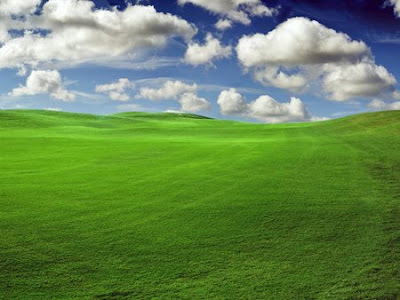 Imagine stepping onto a vast green field. A closer look and you notice circular patches of white grass speckle the landscape. If you know what you are looking at these biological signals might save your life as you proceed. TNT leaching from buried landmines activate plants with an engineered ability to "degreen" in the presence of specific molecules. Though these sentinals have yet to be deployed on the battlefield it is not hard to imagine a technique like this being used to save lives. A clear example of synthetic biology at work this technology was developed by June Medford at Colorado State University. By fully controlling an entire signal transduction pathway in plant cells synthetic biology allows scientists to use predictable on/off signals like plant pigment to do positive work for humanity. Plant-based reconnaissance technology is one of many foreseeable applications for controlled synthetic gene networks. 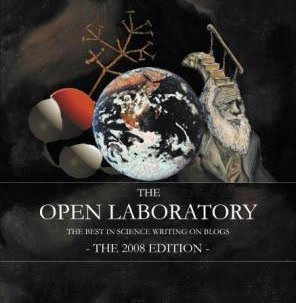 June Medford along with other thinkers like Craig Venter and George Church work at the forefront of this emerging chapter of biotechnology. We are all watching to learn the next twist in this story. A 72 year old woman! Really? REALLY? In keeping with his current trend towards accentuating the positive Richard Dawkins clearly lays out the logic of evolution while explaining how the whale's morphology changed over millions of generations. This is probably the most clear-cut example of evolution on display in the fossil record but certainly not the only one. When I was a teenager I visited my sister who was working for the US geological survey in Washington, DC. It was the first time I'd been the Smithsonian museum of natural history. Though I rushed through to see as many exhibits as possible I paused in the "Ocean Hall" underneath a suspended skeleton of a modern whale. It was standing here that I had the evolutionary epiphany. As I stared up at the tiny hip bones suspended by metal museum cables painted back like invisible stage hands I realized that these were vestiges of long gone hind legs. Every whale living on earth has these bones suspended in cartilage doing nothing but reminding the curious about their storied ancestry. By the power of the web anyone can now go and stand where I stood as a teenager and contemplate the reasons for those museum cables. In fact you can now virtually peruse the whole museum complete with online information kiosks! Amy Goodman reports on activists in Olympia, Washington who discovered one of their own was actually a spy for the US military! This infiltration is in direct violation of the Posse Comitatus Act of 1878. There is a key difference between this instance and the scene from Michael Moore's documentary Fahrenheit 9/11 where a peace group in Fresno, California was infiltrated by the local Sheriff's office. According to the law the incident described by Moore seems to be legal albeit troubling whereas this recent incident in Olympia VIOLATES FEDREAL LAW! The Posse Comitatus Act prohibits members of the Army, Air Force, and State National Guard forces (when such are called into federal service) from exercising nominally state law enforcement, police, or peace officer powers that maintain "law and order" on non-federal property. Read Amy's entire column here at TRUTHDIG. Do not get me wrong, I still like what Obama is doing for this country overall but this kind of thing must stop NOW. And in science this can be the biggest barrier to moving forward. If we can't show an event happening how do we know it is happening at all? Since the 1950's a large gap between what we can see under microscopes and what we can see when we crystallize things (i.e. DNA) has existed. The gap has historically been in the range of tens to hundreds of nanometers leaving many macromolecular events taking place inside every living cell on earth in a black box; inaccessible to the human eye and therefore inaccessible to our full understanding. Though some very complex assemblages of proteins and DNA have been successfully crystallized to superb atomic resolution (below 2-3 ångströms) there are innumerable molecules within the cell that have not. These are the myriad molecules that interact in dynamic ways with portions of their structure constantly moving and changing. They have been dubbed "intrinsically disordered proteins." When biochemists and molecular biologists study these proteins they currently have no good way to visualize them in action. There are however a few ways to look at them. Either take them out of their cellular context, purify them to homogeneity, and pack them into a crystal in order to fire X-rays at them to see where all the atoms sit in a lattice, or freeze them and scan them with an electron beam or force probe. These techniques inherently kill any molecular freedom these little cellular components have to wiggle about and do that voodoo that they do. 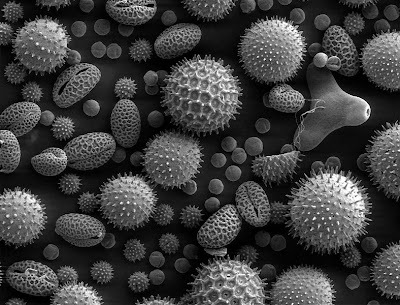 With the advent of scanning electron microscopy (which produced the image of pollen grains above) and transmission electron microscopy the blind spot in the realm of teeny tiny science has shrunk but the experimental conditions do not allow native observations. Looking at objects with regular old light waves is impossible at these tiny scales because of Abbe's diffraction limit. The reason very small things can not be seen with a regular optical system is that the wavelength of light is longer than the details in need of being resolved. Researchers have recently found a way around this. 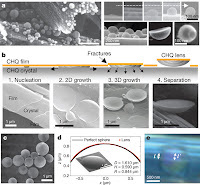 By constructing extremely small lenses they can overcome the diffraction limit. What's more these lenses are self-assembling adding to their intrigue allowing imagination to run wild with speculation of future application. Unlike conventional geometrical optical lenses these lenses bow the light's trajectory in a curved manner. This results in an unprecedented near-field magnification that defies the diffraction limit! In short we may be close to peering into a black box that has never been opened before. In my field of chromatin associated proteins this technique may allow us to literally watch the elusive histone tails as they interact with binding partners on a single molecule scale. We might someday watch the linker histone as it takes a chromatin array and folds it into the accordion-like 30 nanometer fiber. We might be able to say once and for all whether or not there is an operable "histone code" that dictates transcriptional accessibility and if so how exactly it works. Begin listening to the following Nature podcast at 6 minutes and 14 seconds in to get the scoop from the primary researchers. So says the liars at FOX news. Luckily we have citizen journalists to give us a view from the streets (and canals). The sad part is that your average US Midwesterner sees FOX news is the infallible giver of truth and will probably not have the opportunity to see for themselves how they are deceived. Can not wait for blogs to tear down FOX someday. I envision Bill O'Reilly still ranting in a dilapidated concrete building in New York city as the camera crew finally leaves him to "do it live" all by himself. This evening a meeting was held for the volunteers that run the Matter bookstore in Fort Collins, Colorado. Why Should We Buy Local? Some local business owners in Denver, Colorado tell us. Thanks to Beth Kopp who is doing a wonderful job bringing my favorite local book store into the light of the internet world. I'm going to Todd Simmon's Yurt-home tonight for a BBQ. Will put up some pictures later. Todd founded Matter bookstore in Fort Collins Colorado in the early 00's. I began volunteering here a few weeks ago as I have been an adoring patron for nearly 4 years. Little did I know that the bookstore and its sidekick Wolverine Farm Publishing are a joint non-profit 501(3)c organization that is volunteer run and outreach minded. Read more about their joint mission here. The mark of a true statesman is a grasp of knowledge outside his area of expertise. Our Energy Guru Steven Chu makes his mark in the arena of pop culture. Reminded me of Christie's pet project. Google joins the world in commemorating what would be the 153rd birthday of a man that changed human history. Nikola Tesla ushered in the age of alternating current, radio, and television with fanfare. Though his showmanship as a scientist often made overt skeptics of his colleagues his ideas were centuries ahead of their time and are only now receiving the kind of consideration and awe they deserve. When presenting his new concepts he insisted that one of his coils (pictured above) be spouting off the visual manifestations of electricity, popping and fizzling so loudly as to make his words inaudible. 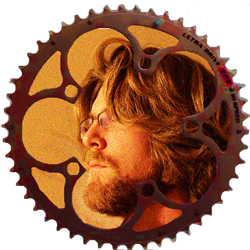 If his contemporaries could have heard his voice they would see he had an infectious obsession with progress and the idea that the hidden powers of electricity and magnetism could be unlocked to allow humanity to live more easily. He had a vision for free and equitable POWER (in all philosophical and practical definitions of the word) for every man woman and child on earth. His efforts to realize this were thwarted by J. P. Morgan and other financial backers who caught wind of Tesla's scheme to deliver free electricity wirelessly to the public through Tesla's giant telecommunications tower at Wardenclyffe on Long Island. There was no profit to be made by giving people what the needed freely. But presently, as the internet gains depth and gravity, this vision is being pieced together slowly and perhaps one day will be complete. The ghost of Nikola Tesla breathes life into the very medium in which I pass these keystrokes along. Happy Birthday Nikola! Above pictured is a sculpture of Nikola Tesla located at Queen Victoria Park near Niagara falls, unveiled on July 9, 2006. Tesla is standing atop an AC motor, one of the 700 inventions he patented. The monument was the work of Canadian sculptor Les Dryzdale. T. Boone Pickens Pulls Out! Is this is a guy who can see which way the wind blows or just another green-wagon hopper? T. Boone Pickens announced today he would call off the erection of more than 600 huge wind turbines on the Texas panhandle. The problem - lack of transmission lines. He was banking on the government coming through quickly and constructing a "smart-grid" that could take his product (electrons) to market. Good luck waiting the eons it must seem to these NOW NOW NOW profiteers. They have no patience. There is money to be made and they want in today not 25 years from now! The problem with big wind energy sources is that they are variable, inconsistent, and often located too many miles away from the people that would use the energy. The real hurdle to unleashing the floodgates of the "Saudi Arabia" of wind power that exists all over our fruited plains is an effective means of energy storage and transfer. If a hydrogen economy does emerge and the highly pressurized infrastructure comes to fruition the on-site conversion wind-generated electricity to isolated/pressurized hydrogen gas would be a meaningful option. NREL and Xcel Energy have been collaborating on this scheme for years. Why can't T. Boone use this technology at his wind energy outposts? Am I missing something other than profit-hunger-induced shortsightedness here? This image comes from a National Geographic Blog. The subject - Piaractus brachypomus - an Amazonian fish with an eerily similar set of chompers to you and I. They use these flat masticators to crack nuts and seeds. I initially thought it was photo-shopped... Uncanny! 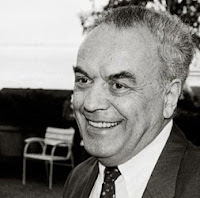 The locksmith that uncovered the keys to genetic manipulation - Wener Arber - expressed some of his thoughts on the nature of natural selection last week at the Annual Meeting of Nobel Laureates at Lindau, Gernamy. P.Z. Meyers at Pharyngula critically reviews his synthesis and takes a particularly skeptical view of his conclusions. The main conclusion Arber makes is that genomes contain a duality of genes that affect mutation rates and therefore the rate of evolution. On one hand there are genes that "benefit individuals for the fulfillment of their lives" and on the other hand there are genes that "act to the benefit of an evolutionary development, for a slow, but steady expansion of life and biodiversity." Arber is saying that there are parts of all genomes that actively promote variation but at the same time there are also those that maintain the happy status quo. He calls the former "evolution genes" - this terminology might come off as a little sweeping and inappropriate but I have a proposed explanation coming up. PZ has a problem with this because he says there is not evidence for the existence of genes "that will only help an individual's many-times-great-grandchildren." This is where my thoughts came rushing in. 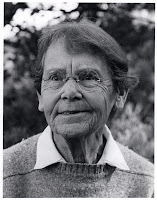 For some random reason last week I was reading various online biographical sketches of Barbara McClintock - the Nobel Prize winning scientist who discovered "jumping genes" aka transposons - these are genetic sequences that can "cut and paste" themselves around the genome's geography. She demonstrated that 50% of the Zea Maize genome is comprised of transposable elements. That is one highly variable genome! She spent a large part of her career studying the evolution of the corn plant and made some profound observations about the nature of the genome before the structure of DNA was even known. I digress. I propose that these transposable genetic elements are the very "evolution genes" that Arber is talking about. Consider that some transposons have heat-shock like promoters (for non-scientists - promoters are like genetic bookmarks that tell the cell which pages of the blue-prints to read in order to build the cell's machinery). Heat shock promoters become engaged when a cell is subjected to stress- starvation, extreme heat, cold, etc. etc. It has been proposed in the literature that increased rates of mutation due to increased rates of transposition may be beneficial to a population of cells under environmental stress1. Thus if the environment is pleasant "status quo genes" are free to maintain a steady biological state, whereas in changing environmental conditions the "evolution genes" can come out of dormancy, even after epochs, to save the day. In the end PZ criticizes Arber's talk saying that it really doesn't bring any new ideas to the table. Well I have noticed that the blogging-heads mentality of new new new everything really does not allow us to reflect and reorganize old knowledge in possibly useful ways. The point Arber is making really builds an accompanying theme to the premise of Dawkins' the Extended Phenotype. In that book Dawkins explains how genetic instructions intertwine with the non-living environment through behavior modulation. Arber is saying that the non-living environment ultimately and actively directs the course of evolution through activation of variability-promoting genes (even though variation is usually detrimental). I think PZ was initially confused in thinking that Arber was assigning some kind of higher direction to that non-living "natural reality." 1.Strand, D., & McDonald, J. (1985).